The electronic duo from Seattle has a new album coming out Sept. 8 and was the closing headliner at Bumbershoot. It’s becoming a tradition for the final Main Stage act of Bumbershoot to be a more recent Seattle artist to hit the mainstream. 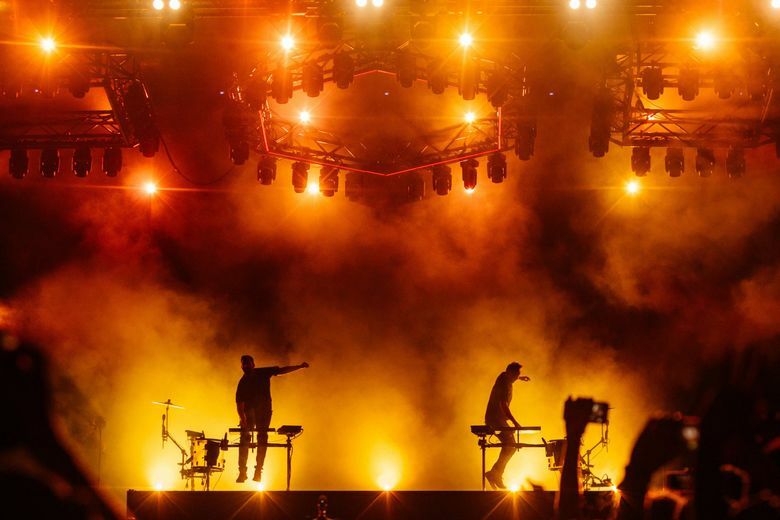 Last year it was hometown “Same Love” rapper Macklemore, and this year, Seattle-bred electronic duo ODESZA—made up of producers Clayton Knight and Harrison Mills and their Northwest-bred band — brought down the house and the power. As people crammed closer to the stage, alight with ODESZA’s icosahedron logo and colorful, Rorschach-style videography, the band dove into the euphoric “All We Need.” About 20 minutes into their hour-and-a-half set, complete with a drum line and horn section, everything went quiet and dark. The day before, at their SoDo rehearsal space, the two wore humility on their sleeves, touching a bit on the meaning of playing a festival they grew up going to. Finally, their friend Sean Kusanagi, now ODESZA’s guitarist and filmmaker, introduced the two. At the same time, a whole universe of bedroom producers was becoming more accessible on Soundcloud. Knight and Mills bonded over their mutual obsession with scouring the site for inspiration and teaching themselves production from YouTube. Those explorations would build the foundation of ODESZA’s sound, and later the founding of their own label, Foreign Family, which signs producers and musicians the two discover on the internet. Five years later the two have fans across the globe, and their song “In Return” has spent 12 weeks on the Billboard Hot 100. Part of what makes ODESZA so special is the way their music stops time and wraps the listener in a cocoon of emotion: Their production of “organic overtones” or acoustic sounds give the listener a tie to the past while the weight and body of the synthesizers and other effects push their ears toward the future. Much of that essence is influenced by their Seattle upbringings and by getting through dark, rainy winters. Their newest album, “A Moment Apart,” which will be released Sept. 8, is the pair’s most Northwest album yet. Encompassing a whole array of emotions — from light to dark — it feels more fleshed out and nuanced than projects past. “A Moment Apart” also features many special guests, from newcomer Naomi Wild to soulful heavy-hitter Leon Bridges, both of whom graced the Bumbershoot stage on Sunday during the ODESZA set. ODESZA begins their world tour for “A Moment Apart” in New Zealand on Sept. 14. They played Sunday knowing it would be awhile before their next hometown show. Fans swayed to their closing hit, “Meridian,” and on the two epic encores complete with fireworks accents, Knight and Mills jumped, danced and sang along.